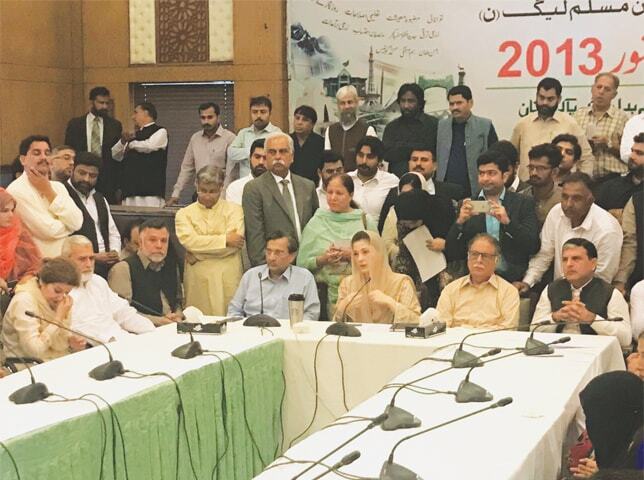 LAHORE: Maryam Nawaz speaking at the meeting held at the Punjab chief minister’s secretariat in Model Town. LAHORE: Maryam Nawaz on Saturday officially kicked off the election campaign of her mother and former first lady Kulsoom Nawaz, who is currently undergoing cancer treatment in London, and said she would be virtually staying in the Lahore constituency of NA-120 to ensure victory for the ruling Pakistan Muslim League-Nawaz (PML-N) in the by-election. The election to the National Assembly seat, which fell vacant due to the disqualification of former prime minister Nawaz Sharif as MNA, will take place on Sept 17. The former premier’s daughter reached the Punjab chief minister’s secretariat in Model Town, where she held a meeting with her party’s workers and representatives of the NA-120 constituency, at the head of a car rally from her Raiwind residence. Chief Minister Shahbaz Sharif was not present at the secretariat at the time. In the last four years the building has repeatedly been used by the Punjab chief minister’s son, Shahbaz Sharif, for electioneering and other such activities. However, this time he has either dissociated from the canvassing for Mrs Nawaz himself or has been made to stay away from it, fuelling speculations about a rift in the Sharif family. Maryam was flanked by the former PM’s trusted aide, Senator Pervez Rashid, when she spoke to the PML-N’s local leaders and workers and directed them to mount an “aggressive” campaign in the constituency. Amid slogans in her favour, she urged the party’s members to shun their differences, if any, and join hands so that her mother wins the by-election handily. She also asked about the ongoing development works in the constituency and instructed the councillors, vice chairmen and chairmen of the local bodies to go door-to-door to listen to the residents’ problems. She also appointed former MPA Hafiz Nauman as convener of the campaign. “I will be with you in the constituency [NA-120] and we will work together for the success of Begum Kulsoom,” Maryam said, asking them to pray for quick recovery of her mother from throat cancer. “This election will determine the future of the country,” she told the charged workers. According to sources, Ms Nawaz may replace Shahid Khaqan Abbasi as the country’s chief executive in case she wins the upcoming election. Maryam claimed in her speech that conspiracies had constantly been hatched against her father. “Each person he [Nawaz] gave love to turned against him,” she remarked. Meanwhile, the sources told Dawn that Maryam did not want to leave the election campaign to her cousin (Hamza Shahbaz) because she saw it as an extremely crucial event for the political future of the former premier’s immediate family members. “After getting a go-ahead from Nawaz Sharif, she formed a team of people who are more close to her father than her uncle,” a party source said. ECP announces election schedule for NA-120, which was left vacant after the disqualification of former PM Nawaz Sharif. A few months ago, another term seemed guaranteed for the recently disqualified PM. How did it all go so wrong for him?